What’s in a title? The answer in Timothy Findley’s play “Elizabeth Rex,” an imagined night when a distraught queen hunkers down with Shakespeare and his fellow players in their stable quarters, is everything. And in its riveting search for the full answer, Chicago Shakespeare Theatre has created a night to remember. The queen’s proper honorific is Elizabeth Regina. It is the profoundly distressed but famously willful Elizabeth who, in Findley’s telling, coins the oxymoron Elizabeth Rex to express the hard reality of her life. To vie with kings, to protect her people, indeed to ensure her own safety, she must act the king. She must, to borrow Lady Macbeth’s phrase, unsex herself. Ah, but there’s the rub, for it is Elizabeth Regina who is sick at heart this night: She has consigned her lover turned traitor, Robert Devereux, the Earl of Essex, to the headsman’s ax. Her adored Essex will die at dawn. Only Elizabeth can commute his sentence, but to do so would be a fatal show of womanly weakness. What must be, shall be. And so the queen, who has just whiled away part of the evening watching a command performance of Shakespeare’s “Much Ado About Nothing” – how’s that for irony? – decides to murder sleep in the players’ company, and pops in on them in the royal barn where they’re staying. In a kind of epilogue to “Much Ado,” the queen who would be king becomes a player in her own tragedy, a compassionate observer of suffering and a recipient of grace. 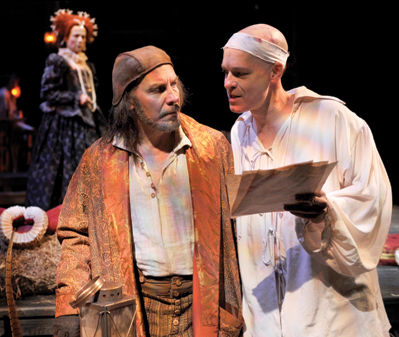 Shakespeare, played with plain humanity and a low profile by Kevin Gudahl, who chiefly interests Elizabeth among these actors now seen as normal folk. She is drawn – indeed forcibly pulled – to a player called Ned Lowenscroft, whom she has just admired as Beatrice in “Much Ado.” Now she encounters quite a different person, a man dying of syphilis and astonishingly candid in upbraiding the monarch for her presumption as well as her self-pity. Indeed, Findley’s searing, witty drama unfolds along Shakespearean lines as a brilliant, flinty pas de deux for queen and fool. The worthy jousters are Diane D’Aquila, who created the role of Elizabeth in the play’s world premiere at the Stratford (Ontario) Shakespeare Festival in 2000, and Steven Sutcliffe, who transmogrifies the wasting Lowenscroft into a specter whom the queen cannot outflank and whose jibes she must absorb for the truths they bear. D’Aquila’s splendid Elizabeth manages, turn by swift turn, to be droll and vulnerable, regal and penetrating. She looks the glorious queen, but speaks with kingly authority – until the night’s withering hours cast their pall over her heart and spirit. As Lowenscroft presses Elizabeth to acknowledge her love for Essex and act the woman, D’Aquila’s increasingly anguished rejoinders bring a hush to the house and with it a heightened sense of paradox: Essex may be in the tower, but the queen is reduced to the lowly environs of a barn, her companions conjurers of illusion. It’s to director Barbara Gaines’ great credit that the conceit of monarch and fool works as convincingly as it does. 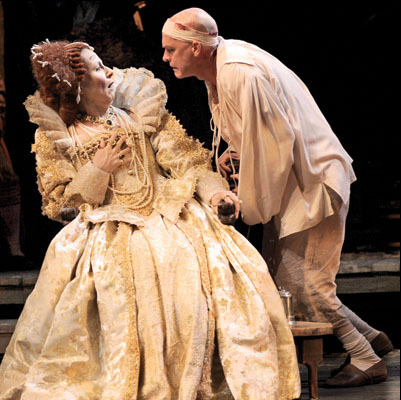 Elizabeth and Lowenscroft get into real shouting matches, but it is the practiced actor – even in his desperate illness – who swoops in and out of these collisions, perhaps measuring his impertinence. While it’s also quite something to watch D’Aquila’s impressive queen take such sauciness from a commoner, we glimpse constant reminders that Elizabeth is not herself tonight, that she’s in fact looking for something, whether answers or simply oblivion, amid this motley lot of barn dwellers. Motley, and fascinating, they are. There’s the chattering old seamstress (Mary Ann Thebus) who can never find her specs, the even more ancient hanger-on (Bradley Armacost) who remembers when he had a fine leg for dance and the petulant Irish actor (Andrew Rothenberg) who will have no truck with this English queen. There’s even a bear in the barn. Complete with a loft and strewn with hay, designer Daniel Ostling’s grand stable is fit for, well, a horse if not a queen. You can almost, with the deep-breathing and satisfied Elizabeth, smell it. In any case, this richly flavored and smartly acted enterprise fills one’s nostrils with the complex scent of truth.